An emotionally distant and depressed writer of travel guides must carry on with his life after experiencing family tragedy. This movie was a Christmas movie, released on December 23, 1988; its box office in the U.S. was $32,632,093 (Wikipedia). The 1985 novel by Anne Tyler, upon which it was based, was a huge bestseller and a finalist for The Pulitzer Prize. 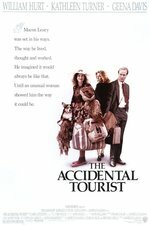 "The screenplay for 'The Accidental Tourist,' by Kasdan and Frank Galati, is able to reproduce a lot of the tone and dialogue of the Anne Tyler novel without ever simply being a movie version of a book. The textures are too specific and the humor is too quirky and well-timed to be borrowed. The filmmakers have reinvented the same story in their own terms. The movie is a reunion for Kasdan, Hurt and Turner, who all three launched their careers with 'Body Heat' (1981). Kasdan used Hurt again in 'The Big Chill' (1983) and understands how to employ Hurt's gift for somehow being likable at the same time he seems to be withdrawn. "What Hurt achieves here seems almost impossible: He is depressed, low-key and intensely private through most of the movie, and yet somehow he wins our sympathy. What Kasdan achieves is just as tricky; I've never seen a movie so sad in which there was so much genuine laughter. "The Accidental Tourist" is one of the best films of the year." "'The Accidental Tourist' observes the long, slow reawakening that occurs in Macon after he has hit rock bottom. Though this process is presented in tiny, artful increments in Miss Tyler's novel, it's not the kind of transformation that can easily be captured on the screen. For one thing, Macon barely seems to change at all until this lengthy and meandering film is almost over. Mr. Hurt flinches his way through the story with a pained morose expression that doesn't lift until the film's final moments. "A novel can successfully incorporate such pronouncements into its larger scheme, but a film is better off conveying the same ideas in more visual and indirect ways. But 'The Accidental Tourist' often relies on Miss Tyler's methods without tempering them, and gives a tone of crashing obviousness to material that need not have seemed that way. In addition, the screenplay by Mr. Kasdan and Frank Galati doesn't do much to compensate for moments when Miss Tyler's dialogue lacks a conversational ring." "Geena Davis was still relatively new, but I remembered seeing her in Fletch after later seeing her in The Fly (be afraid, be VERY afraid) and one of my favorite 80’s movies, Beetlejuice. We enjoyed that so much that a group of us went to see Earth Girls are Easy – which was like a 90 minute Julie Brown music video! But as Muriel, Davis brought her dimple-flashing smile, charming good looks, oddball style and off-beat sense of humor to bear. She needed to be someone you would instantly like and want to talk to, yet who made you somewhat uncomfortable and was very flawed and just a bit out of step with the rest of the world. Reading the book I don’t think I immediately pictured someone as tall and robust as Geena Davis, thinking Muriel as someone slighter and overly thin, but upon seeing Davis in the movie I wondered how I could ever have doubted the characterization. She truly earned her Oscar in a great field of 1988 nominees. "But the thing that stuck me again and again was William Hurt as Macon. How can you possibly portray someone trying to avoid life happening to him? Someone who has a definite ‘happiness boundary’ that separates the comfort of things known from the avoidance of the unknown? These are all things that are the purview of books, that cannot be spoken on screen, and yet Hurt masterfully brings them to life in a way that is my favorite performance of his entire career." Geena Davis did indeed have some tough competition that year for the Oscar, and was a newcomer and a surprise win. Baltimore, Maryland is very much part of the film; other locations include Paris and London. Finally, a look at the dog training in the film. Paper Thesis – intended as a study aid for students writing essays about Anne Tyler's novel, this gives an overview of themes and authorial strategies as well as some key quotes; well worth a look. "While armchair travelers dream of going places, traveling armchairs dream of staying put." Yes, it most definitely is! She made a big splash in this role - people were all agog with her performance as the quirky dog-trainer. I never realized until now how appropriate the setting of Baltimore Maryland is to the theme of depression, provincialism, and eccentric lifestyles. There's a real claustrophobia that's also warm and familiar, and resonates with the brothers and sister who are living on top of each other and so intertwined with each other's lives. All the criticisms are true of the film, and yet it's one of my favorite adaptations of a novel for film - a very tricky endeavor but I think Kasdan pulls it off. I'd be interested in what Mefite think - join in! I'm not even sure this film has aged well or if anyone under 30? 20? Has seen it. I have only vague memories of this film and I am pretty sure I saw it before I began reading everything Anne Tyler wrote. When I read the book, I did not really remember the events from the movie so I guess I will have to watch it again. But when I am reading an Anne Tyler book and people are unfamiliar with her work, I tell them that she wrote the book that the movie The Accidental Tourist was based on, and that has never been helpful to anyone. Pity. I love her books! Thanks for this post and for reminding me to rewatch this film! I absolutely love this book (all of Anne Tyler's early work, really, but this one is by far the best) and the movie has always made me happy. Geena Davis absolutely earned her Oscar for this role, but I loved Amy Wright's performance as Rose equally. Rose is an even harder character to pull off, I think, in that she represents everything that Macon thinks is holding him back, but has to show that no, the family is just the family, and she's more than willing to let someone in, and Julian shows that Macon's family isn't quite as odd as he thinks it is. The only real sour feeling I have for this cast is Kathleen Turner, who, while doing well enough, goes a bit too patronizing than the movie requires. Sarah isn't a monster, she's just tired, and it shouldn't feel as wrong as it does when Macon goes back to her for a bit. I need to see this! I remember reading this novel as a Goth Teen circa 1989, even though it wasn't anything I would ever read, I guess because some friend of the family had left it laying around my parents' house. It's a great book (or at least I thought so as an alienated kid), and while I have always been aware of the movie, I somehow never got around to it. Thanks!